Attribution Models in Google Analytics let you assign credit to various marketing channels in your conversion path. Here is an example. If someone first sees your Paid Ad on Google, then comes to your website via organic search 5 days later and finally converts by entering your website directly using a bookmarked URL one week from the first paid ad click, which channel should be credited for the conversion? How do you decide which marketing channels are worth spending more monies on to increase conversions? Attribution Modeling in Google can help you with this. Before we get into attribution modelling, you need to make sure that the following is set up correctly. 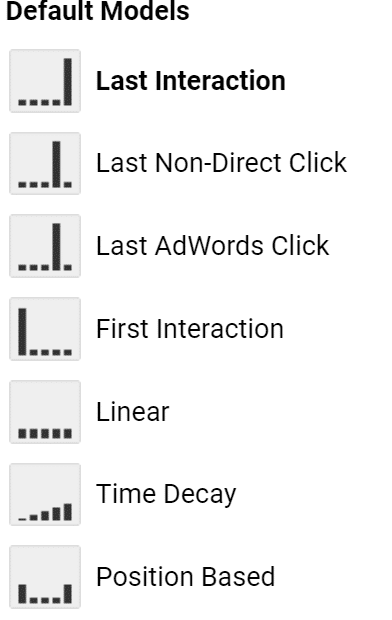 All standard reports in Google Analytics use the Last Non-Direct Click as the default attribution model. In this case, all the credit goes to the last known marketing channel the customer used just before entering your website ( direct is ignored). In the above example, it would be the Organic Channel which would get the credit for the conversion. However, if you are not happy with this attribution, Analytics provides other attribution models for you to choose from. Here is a list. We will look at the following models in relation to the example mentioned at the beginning of this blog article. In the Last Interaction attribution model, the last touchpoint—in this case, the Direct channel would receive 100% of the credit for the sale. In the Last Non-Direct Click attribution model, all direct traffic is ignored, and 100% of the credit for the sale goes to the last channel that the customer clicked through from before converting—in this case, the Organic channel. In the Last AdWords Click attribution model, the last AdWords click—in this case, the first and only click to the Paid Search channel —would receive 100% of the credit for the sale. In the First Interaction attribution model, the first touchpoint—in this case, the Paid Search channel—would receive 100% of the credit for the sale. In the Linear attribution model, each touchpoint in the conversion path—in this case, the Paid Search, Organic, and Direct channels—would share equal credit (33.33% each) for the sale. In the Time Decay attribution model, the touchpoints closest in time to the sale or conversion get most of the credit. In this particular sale, the Direct and Organic channels would receive the most credit because the customer interacted with them within a few hours of conversion. Since the Paid Search interaction occurred one week earlier, this channel would receive significantly less credit. In the Position Based attribution model, 40% credit is assigned to each the first and last interaction, and the remaining 20% credit is distributed evenly to the middle interactions. In this example, the Paid Search and Direct channels would each receive 40% credit, while the Organic Search would each receive 20% credit. In this article, we covered the basic attribution models. Stay tuned to our blog for further updates related to attribution modelling including model comparison tools and multi-channel funnel reports.